We don’t often write about apps. Its only when a particular app enhances your exercise routine, tells a compelling story and involves brain hungry zombies that the story begs to be told. 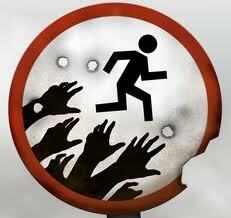 While in search of an engaging exercise app, I came across Zombies, Run! and we haven’t stopped talking about zombies ever since. Zombies, Run! is a fitness application and its not your ordinary post apocalypse kill-the-zombies game. In Zombies, Run! The undead are on the prowl, and out to get YOU. The story begins as you bring in supplies to a safe zone in a zombie infested area, a helicopter crash leaves you stranded outside the compound, but in radio contact with the base, they warn you of the zombies approaching, you can hear them groaning, and yes, you want to run like hell. So lace up your sneakers and get moving! GPS lets you keep track of distance traveled, and a timer lets you know how fast you’re going. As you run, the story continues and you are entertained and engaged for your entire run. If brain hungry zombies chasing you is not motivation enough, as you run you are also completing missions and picking up supplies along the way. These supplies help you enhance the compound and complete your missions. The game can be used with GPS, but for treadmill runs you can opt to use your accelerometer instead. The company has kept good on their promises to add additional missions and seem to be constantly improving on an already fun and entertaining fitness concept. I decided to test the application at night, and that did add to the scare factor. I have always said that I hated to exercise and that the only time you would find me running is if someone was chasing me with a knife… well add to that – flesh eating zombies, they seem to work pretty well too. The app is a bit pricey at $7.99 but it is an exercise prograand a roleplaying game and a story, so I can’t complain check out zombiesrungame.com for more information.